NWP1000: Features: -Tozz game.-Material: Durable, high-quality foam.-Super tough, soft touch, great grip football makes learning safe and easy.-One of a-kind shape with center air tunnel helps create spiral.-Soft and flexible for safer play.-Textured for easy grip.-Easy to launch.-Easy to catch.-Center air tunnel creates spiral.-Tear resistant synthetic paper label.-Ages 6 and up. Dimensions: -Dimensions: 4.9'' H x 4.9'' W x 7.63'' L.
TZH1006: Features: -Volleyball/frescobol combo game set.-Set is a must have for your next party or outing...it will supply hours of fun for your friends and family. NWP1001: Features: -Dizk game.-Super tough, soft touch, great grip fluting disc.-Unique design, flies, floats, flexes.-Center hole creates more ways to catch.-Super tough, soft touch, great grip flying disc.-Tear resistant synthetic paper label.-Special dura-soft foam.-Ages 6 and up. Dimensions: -Dimensions: 10.5'' H x 1.5'' W x 10.5'' L.
Match your knowledge of football strategy against the players, coaches and everyone watching as you try to predict: Will it be a pass or a run? For a gain or no gain? First down on this play? Fundex Games Armchair Quarterback lets you play along. The Driveway Games floating bean bag toss game can be played on water or on land. The kit includes an inflatable target, waterproof square bean bags, and a breathable mesh storage bag. Add to the fun in your game room with this Trademark Games Dart Board Game with 6 Darts and Board. Dart games are great for family night and friendly competition with pals. Have a bar game in the convenience of your own home with these darts and board. This Trademark Games Dart Board Game with 6 Darts and Board features a wire spiderweb that divides scoring segments. The darts and board set can easily be mounted on a wall using the mounting bracket built right onto the board. This Trademark Games Dart Board Game with 6 Darts and this dart game. This new game of strategy is addictive and challenging for all ages, and amazingly simple to learn. But make sure you don't lose your chips or whatever you decide to bet with, the tables can turn in the blink of an eye! Players take turns rolling three dice and have to pass, keep or put chips into the pot based on the resulting roll. Players can use chips, coins or anything else they can think of. Fast paced, easy and fun for the whole family. FKS1037: The Outdoor Games collection offers a fun game set for people who like sports. Bring it out and enjoy the day! Features: -Chux shuffleboard game. 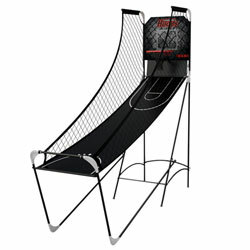 -Outdoor Games collection. -Material: Polyvinyl Clorua. -Durable all weather roll out playing surface. -Eight chux shuffleboard tosses. -Carry / storage bag included. -Complete playing instructions. -Ideal for indoor or outdoor play. -Assembly required. DWY1010: Features: -Material: 35% CARB Certified Composite Wood, 10% Laminate plastic, 5% LED lights and wiring,33 % Plastic PP pellets, 17% Nylon / Polyester Fabric.-Official size.-Long lasting, energy efficient LED's.-Top quality all-weather bean bags.-Requires 4 - AA batteries (not included).-Use for 1 - 4 players. Includes: -Set includes:: 2 Light up targets, 4 Red bean bags, 4 Blue bean bags, 1 zippered storage bag and game rules. Construction: -Rugged wood construction. DWY1011: Features: -Material: 40pct CARB Certified Composite Wood, 10pct Laminate Plastic, 33pct Plastic PP Pellets, 17pct Nylon/Polyester Fabric.-Official size.-Lightweight and portable perfect for travel.-Moisture resistant laminate graphics - will not scratch or fade like paint.-Makes for hours of family fun, from the tailgate, to the backyard barbeque, or beach.-Use for 1 - 4 players.-Carrying handles and folding legs.